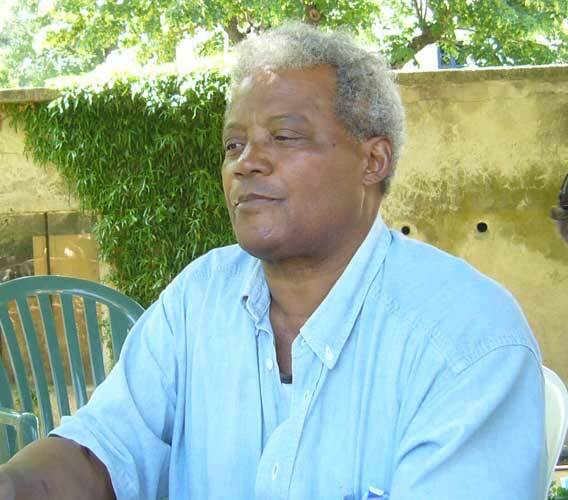 Haitian-born choreographer and musician Herns Duplan studied in the U.S. in the early 1960s before moving to France in the early 1970s where, as a teacher at Paris’ American Center, he introduced the Primitive Dance style in jazz dance, a concept invented by Duplan’s mentor US choreographer Katherine Dunham. 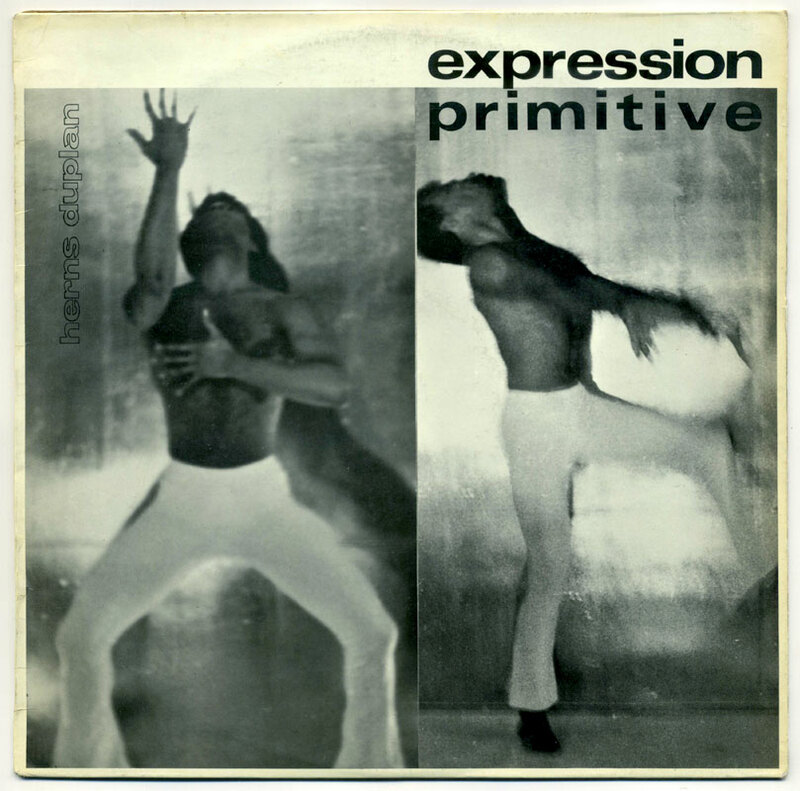 Inspired by African rhythms, Primitive Dance, or “Expression Primitive” in French, allows individuals to move away from dance preconceptions, free their emotions and is also used in music therapy. 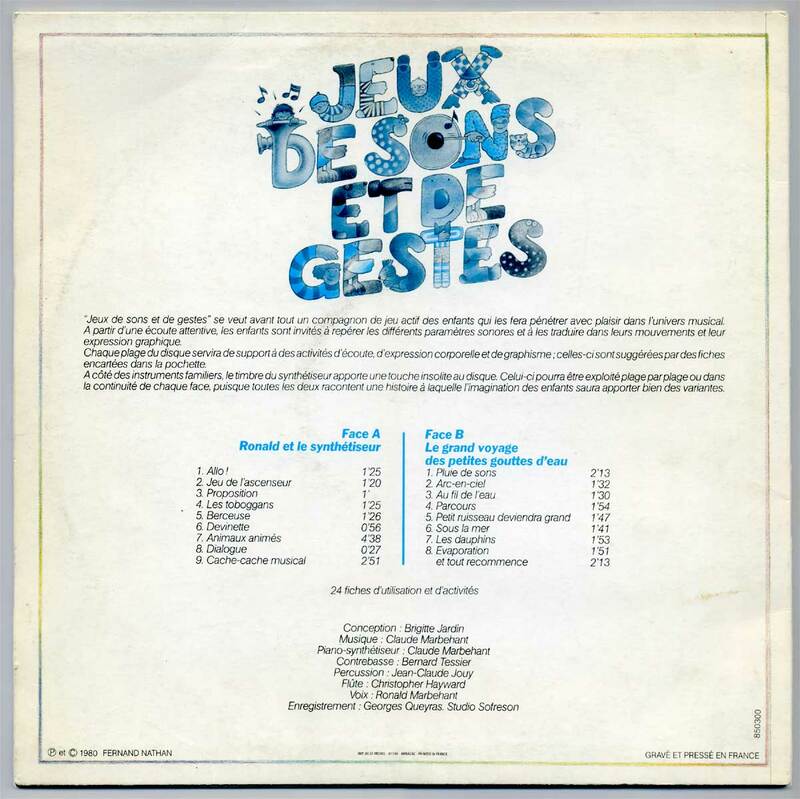 See Duplan’s official website (in French). 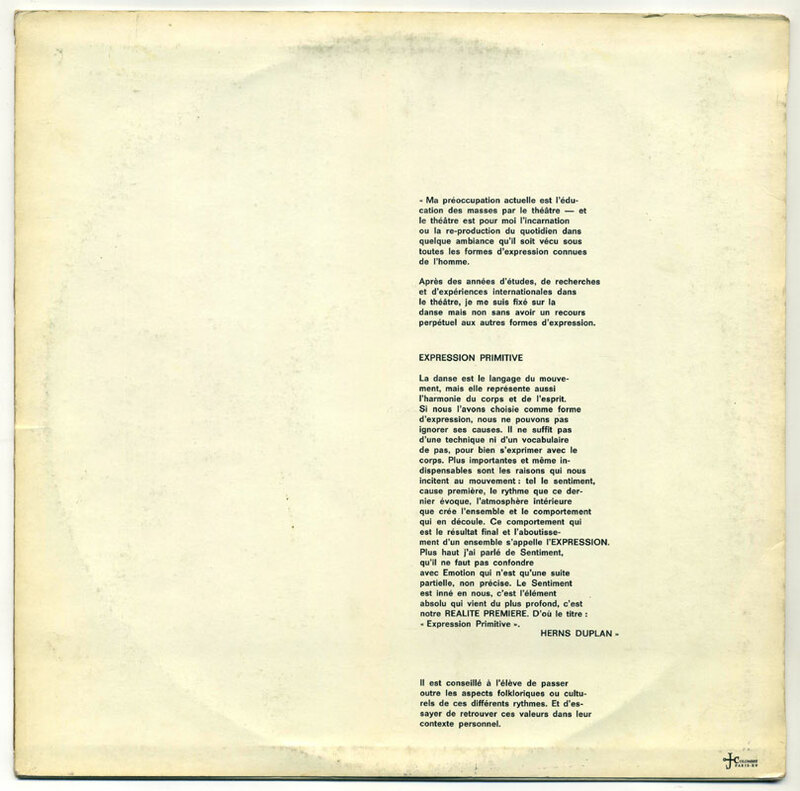 The Expression Primitive LP was published by Le Kiosque d’Orphée in 1971, according to the discography on this site, and reissued as “Rythmes Pour L’Expression Primitive” on Unidisc in 1981, ref. UD 30 1479, with the same tracks in a different order and a different cover art. 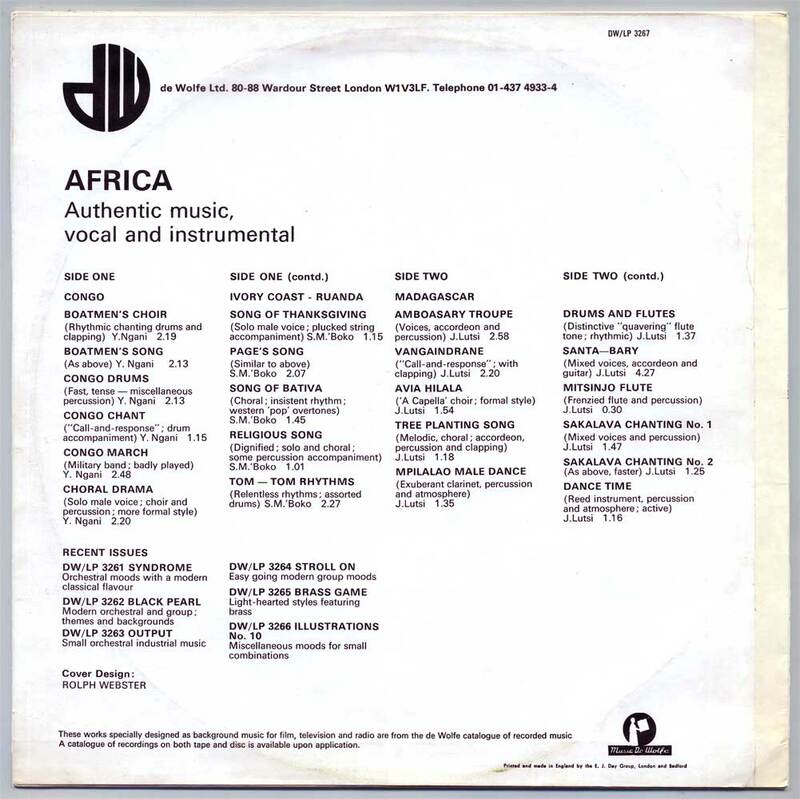 It was recorded in New York by Duplan himself on drums with American percussionists Daniel Barrajanos, Edner Calvin, Morton Saunders and Ronnie. 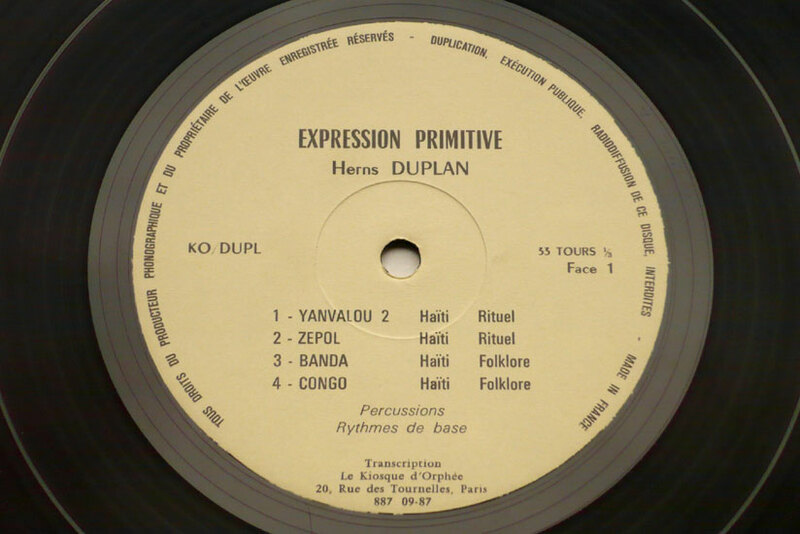 Intended to be used during Duplan’s classes and workshops, the 7 percussion tracks are inspired by Voodoo music and other African rhythms. 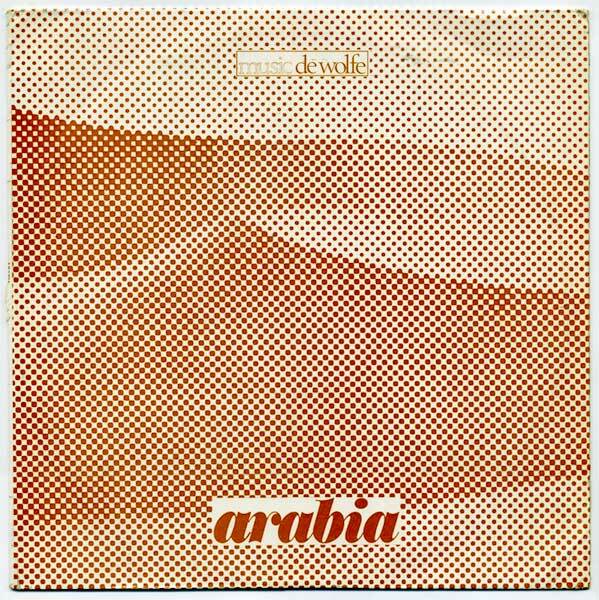 Another library music oddity, this time credited to John Leach – of which I posted another LP before and one of the pillars of the De Wolfe catalogue–, “Arabia” is a collection of Middle Eastern sound vignettes alternating between fake ethnic music and vaguely exotic orchestral mood music ala Cecil B. DeMille. The 30+ tracks are remarkably written and immaculately interpreted by Leach himself, at ease with strings and percussion, as wel as santur, flute or tambourine. 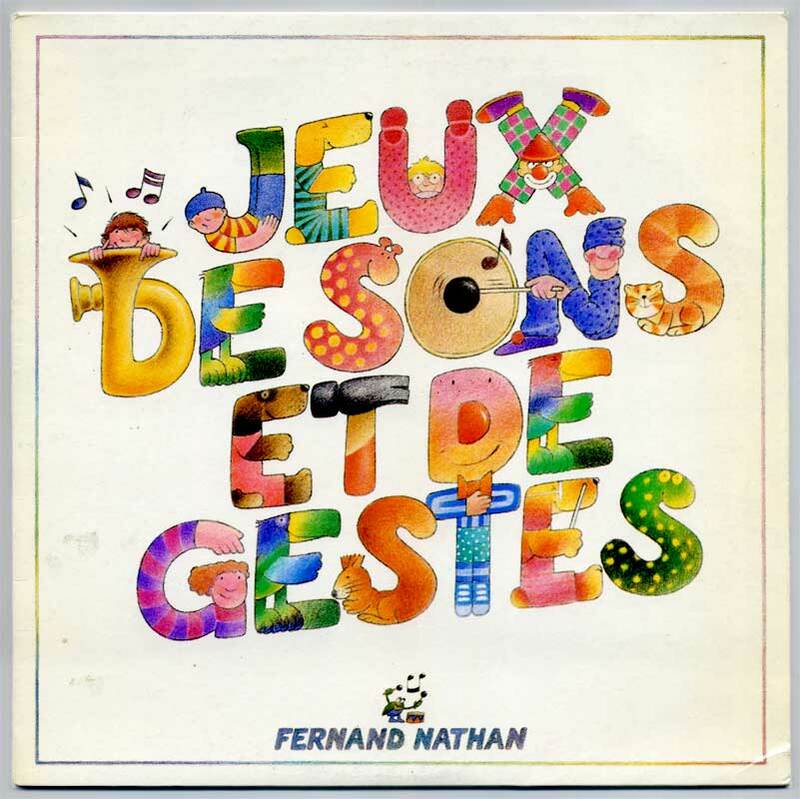 Another evidence library music – an amorphous genre if ever there was one– can be anything you want it to be. 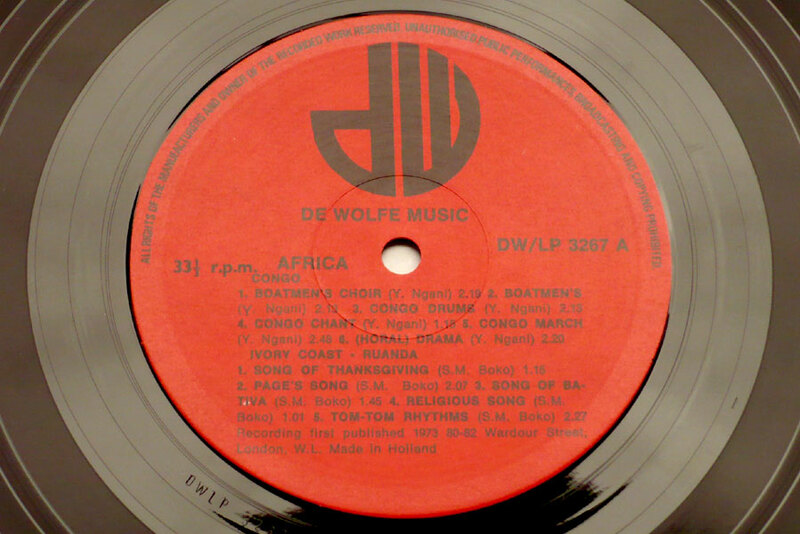 Published in 1973, “Africa” is an LP worth of “authentic” ethnic music from the indomitable de Wolfe catalogue, supposedly documenting music from Congo, Ivory Coast-Ruanda (sic) and Madagascar – that is, countries administred by France or Belgium at various periods. I assume the record fullfils the needs of British documentary film producers of the 1970s in search of Ocora-type ethnic music. 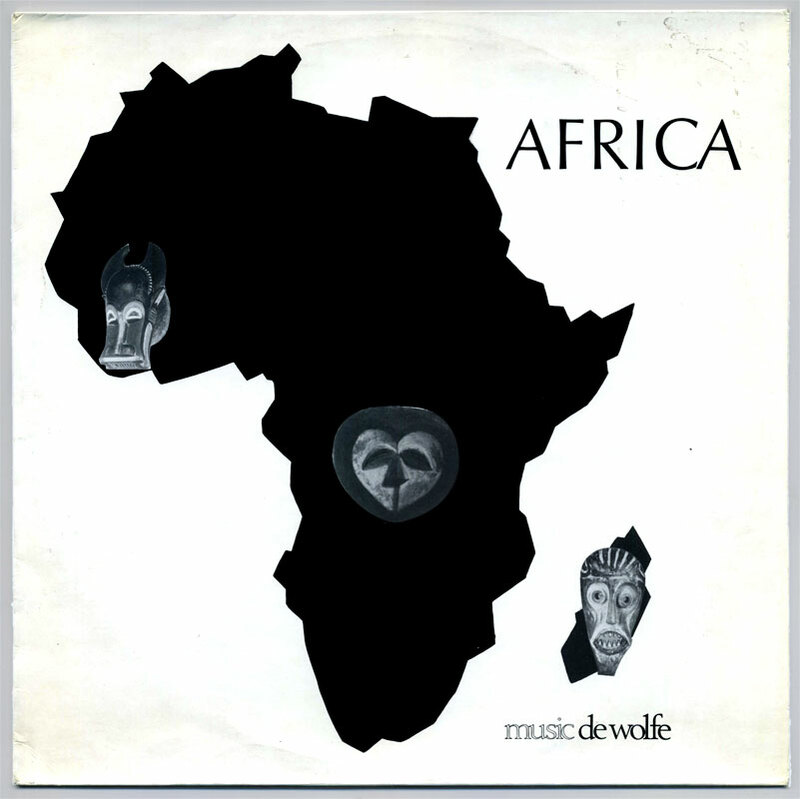 Tracks range from songs with solo accompanyment on kora or balafon to collective chanting and festival songs, from wild slit drums to marching band (! ), as well as religious singing under the influence of Catholic missionaries. 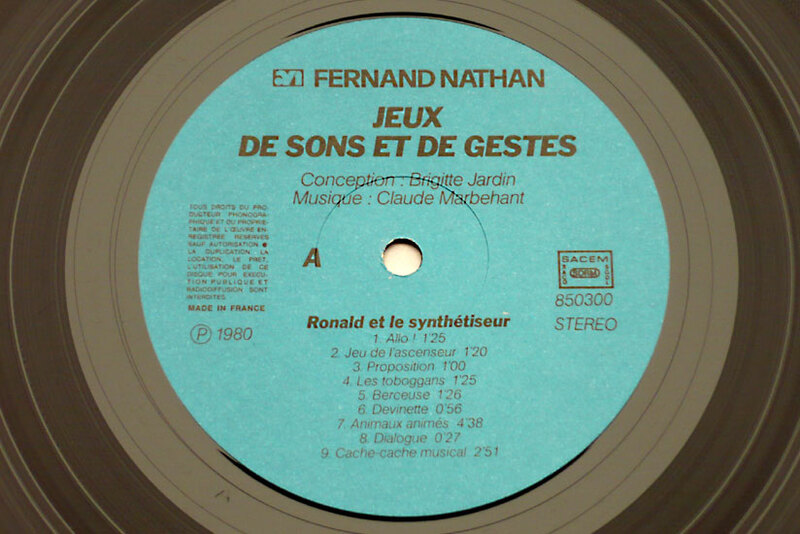 Origin and authenticity is dubious but this is nonetheless a highly unusual library LP. 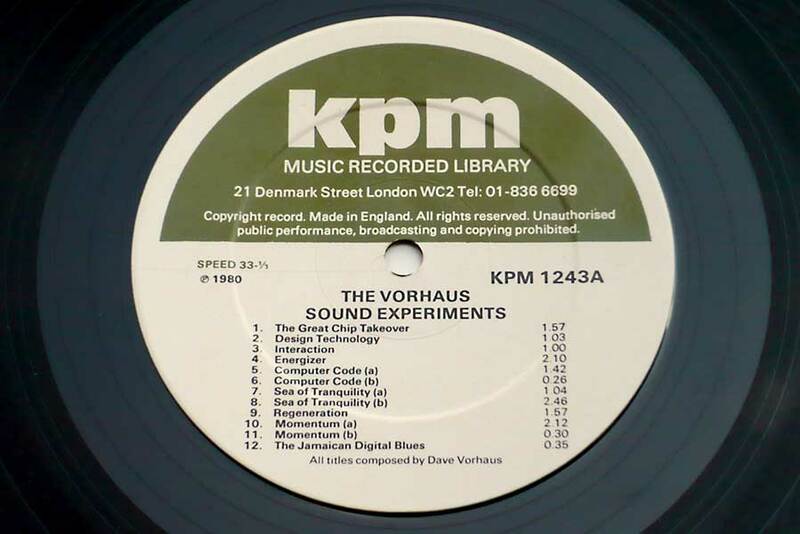 Published in 1980, The Vorhaus Sound Experiments was Dave Vorhaus‘ first solo release on KPM and the beginning of a fruitful collaboration with the prominent British library music company. 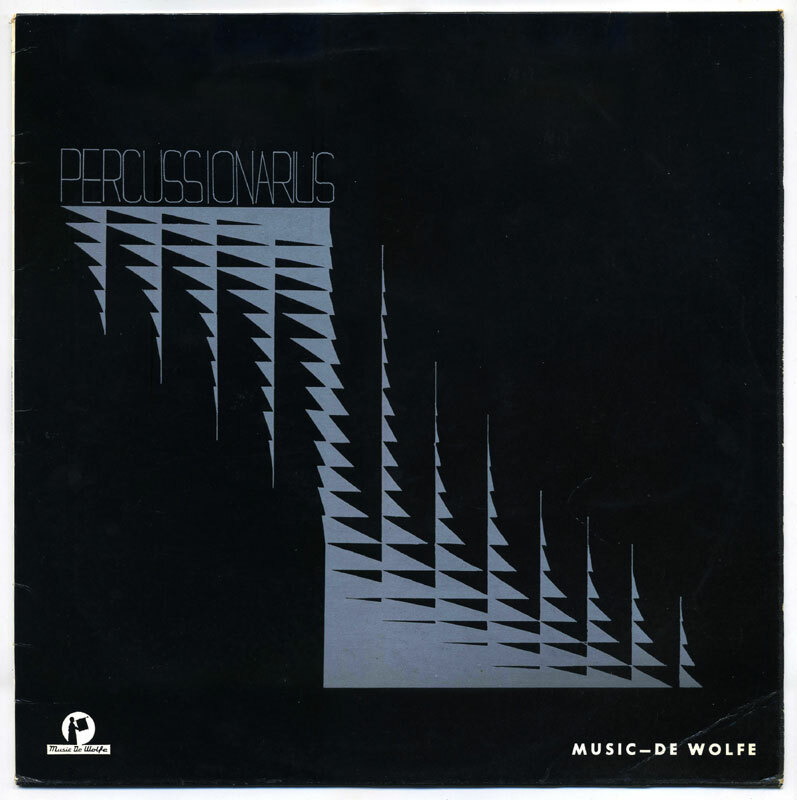 Vorhaus never envisaged producing incidental, background music, though, and his was always meant as music of the highest order with elaborate arrangements and sumptuous electronic sounds, as is the case in this fine collection of electronic miniatures. 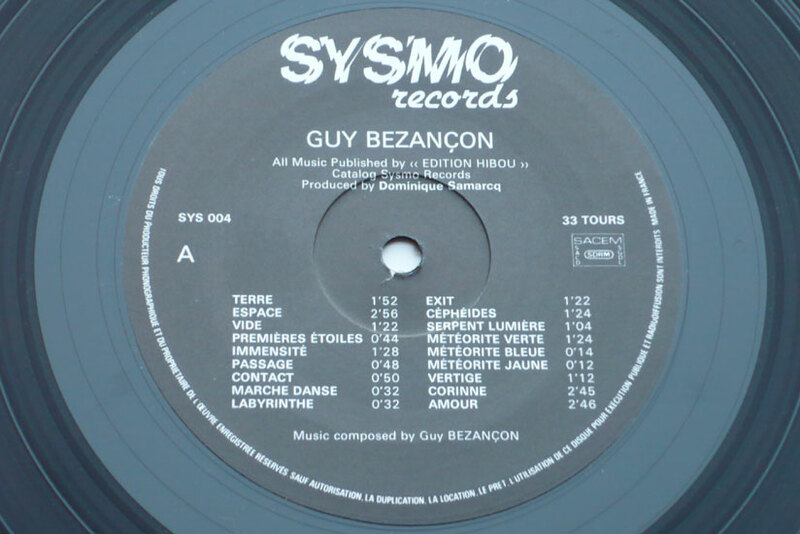 Some of the tracks on this LP were used for the soundtrack of cult Australian TV series Prisoner: Cell Block H, appearing on Australian TV between 1979 and 1985. 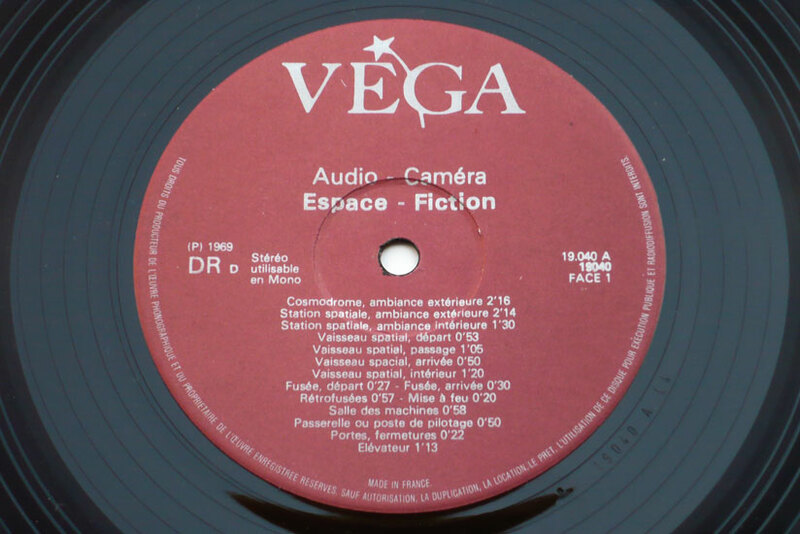 Some of these tracks are available on YouTube “videos”, like Disintegration Series, Momentum, Time Base or Voyager One, albeit with bad sound quality. 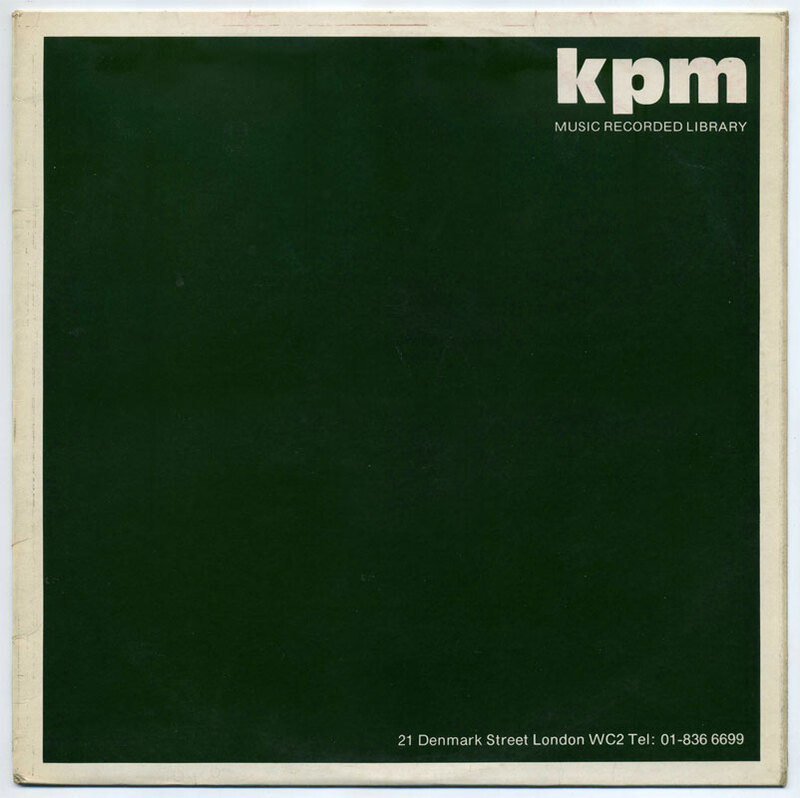 The Prisoner series also included music lifted from other library music LPs by the likes of Keith Mansfield and John Saunders. 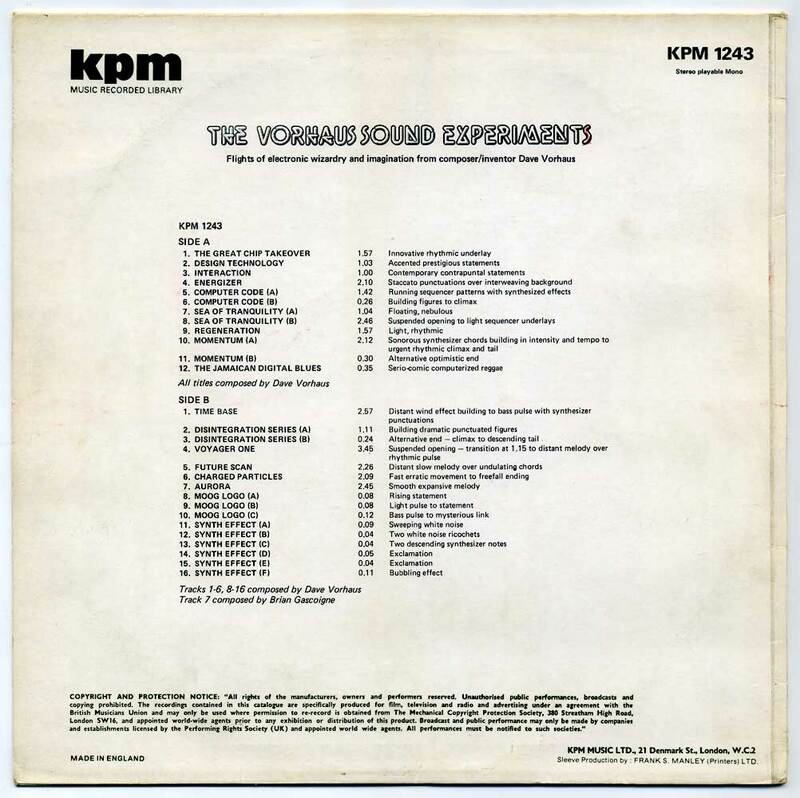 No surprise, then, The Vorhaus Sound Experiments sometimes verge on film music and is often reminiscent of Colin Towns’ remarkable Full Circle soundtrack, 1978. 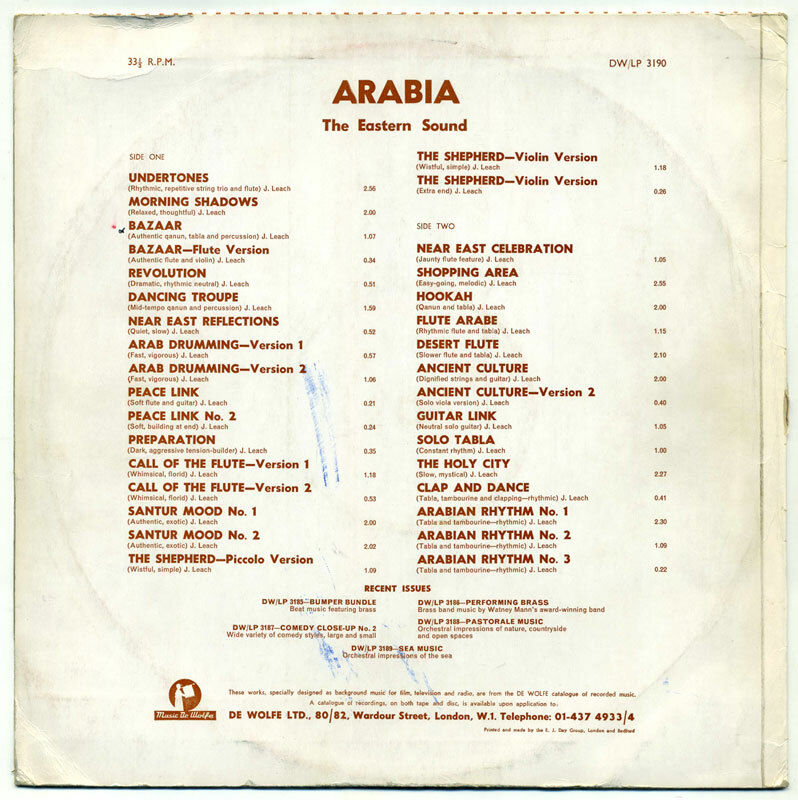 Additionally, track #19 Aurora was written by film music composer Brian Gascoigne, famous for The Emerald Forest soundtrack. 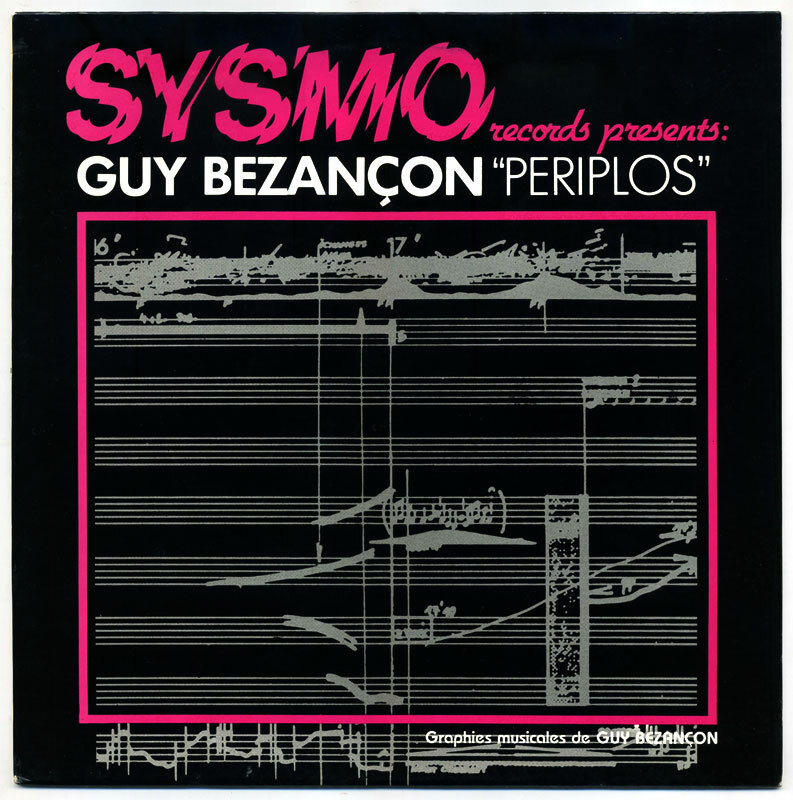 What seduces in a solo percussion LP is the undiluted, uncompromising flavor. What bores is the ensuing monotonous, closed-circuit performance. 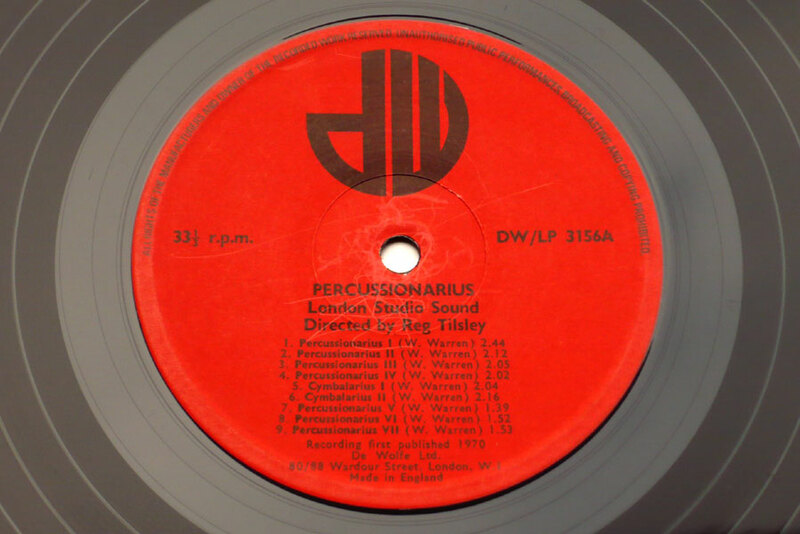 The Percussionarius LP is a little different: it is not a demonstration LP, it is varied and the drummers are not showing off their muscles. Rather, this is mood music for drums, if you’ll pardon the oxymoron, played by 2 or 3 percussionists at most, though often less than that. 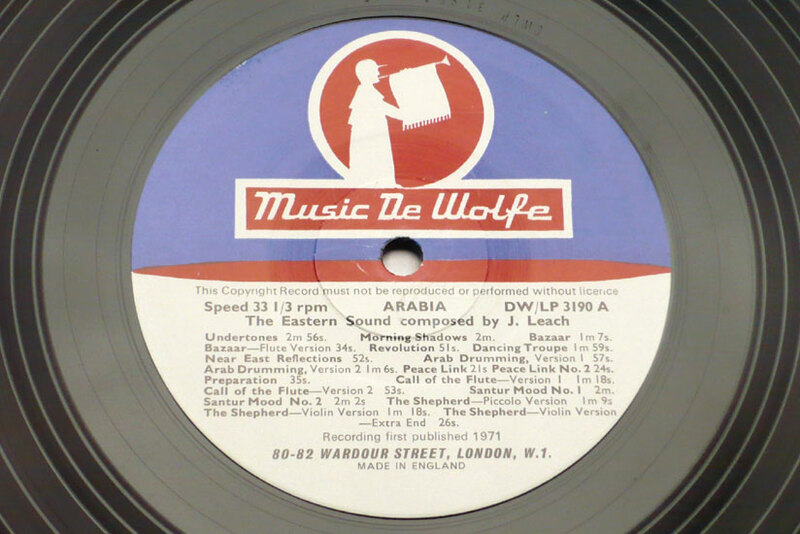 The musicians call themselves London Studio Sound, supposedly an off-shoot of the London Studio Group, also on De Wolfe. 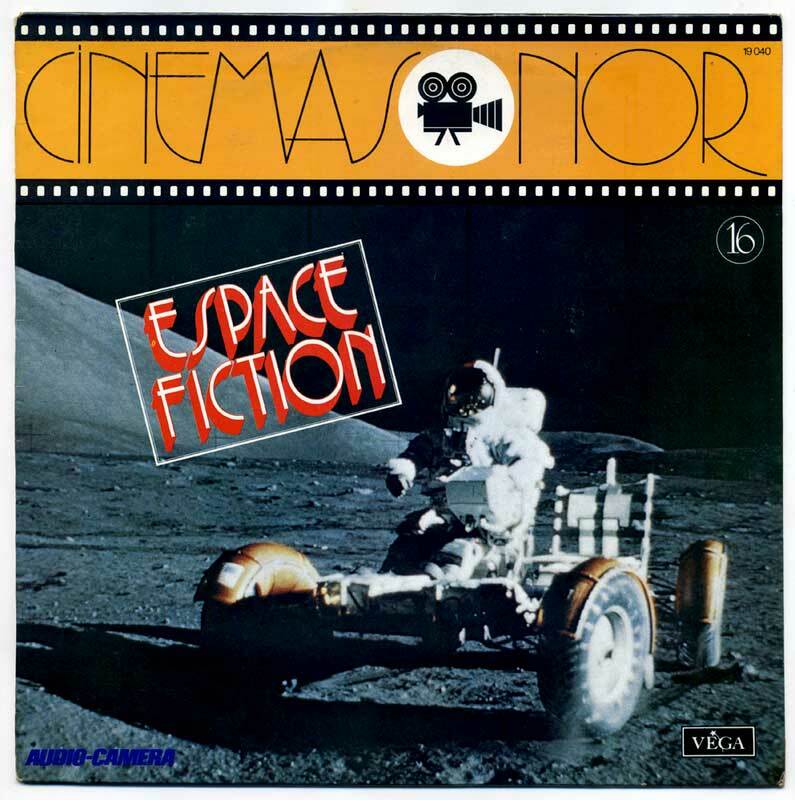 The composer is Walter Warren, aka James de Wolfe himself, who, among other things, composed music for the Monthy Pithon Flying Circus television series between 1969 and 1973. 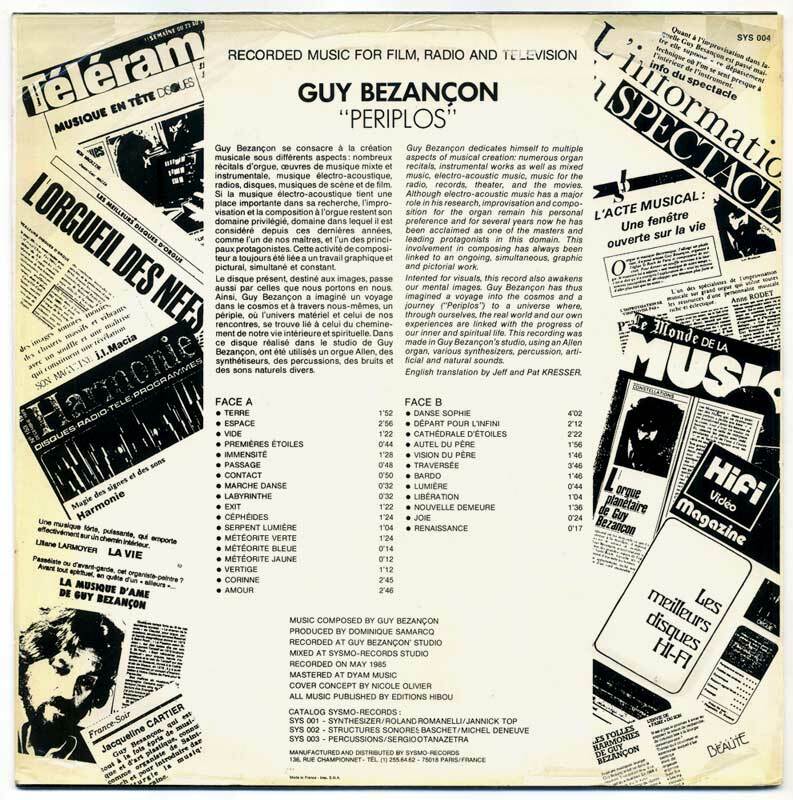 ♫ Published as a mono LP in 1970, Percussionarius is a very peculiar disc of chasing film music with touches of film noir soundtrack. 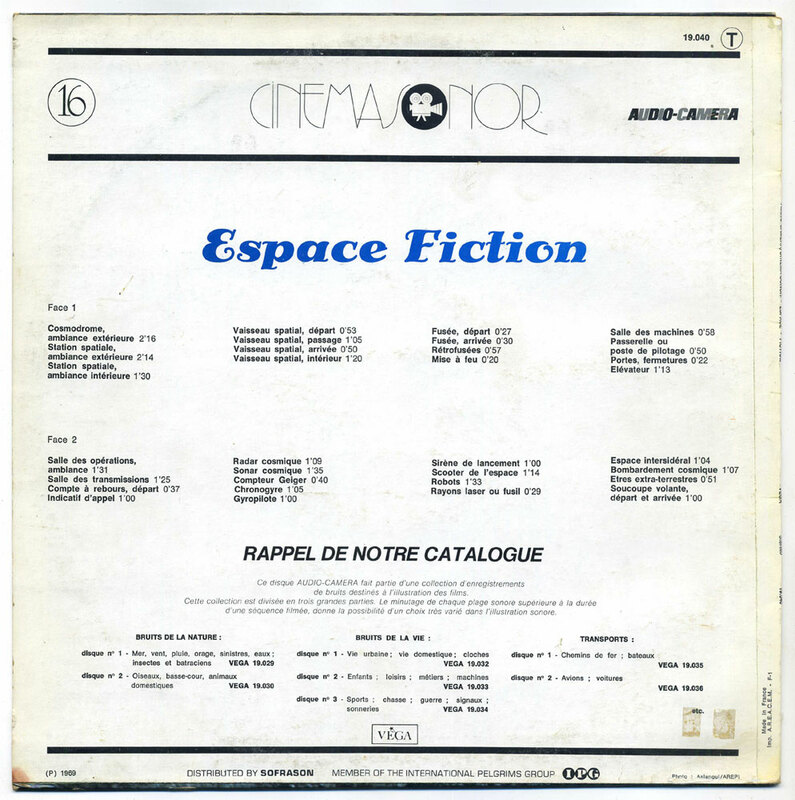 It starts with a handful of powerful percussion fireworks, yet the rest of the LP comprises shorter, unobtrusive tracks suitable for mystery films or radio plays. The addition of an upright bass and reeds on several, more laid-back, cool jazz numbers (#11 and 17 to 19), makes the music sound like Ken Nordine’s backing jazz combo on Colors, 1967, or some Tony Schwartz LP of the 1960s. 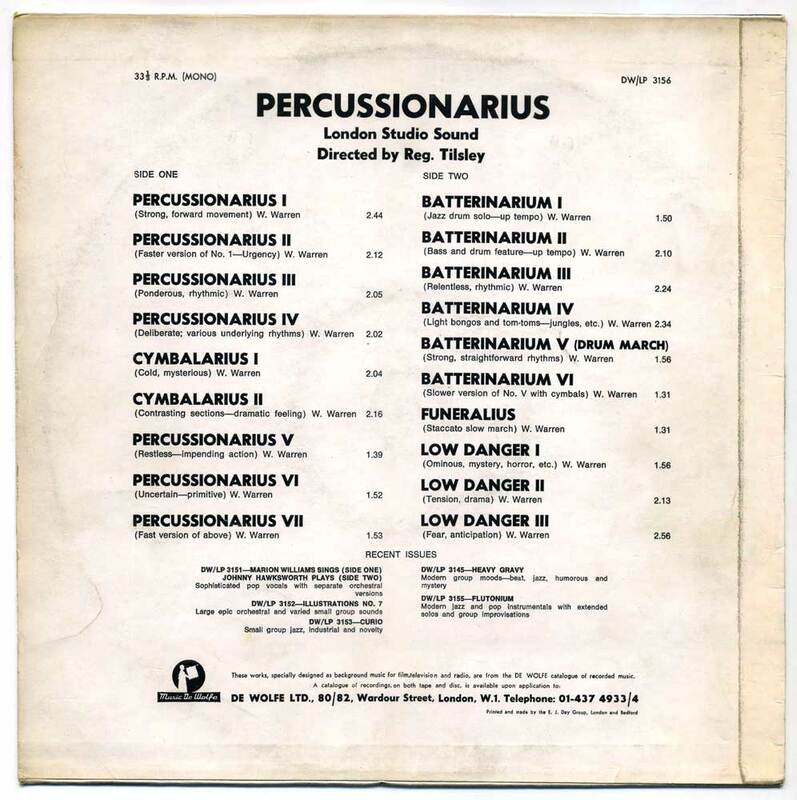 On the other hand, there’s the pair of tracks titled Cymbalarius, based on cymbals and gongs exclusively, creating an atmosphere of expectation and menace.